the first human mission to Mars. If getting to Mars will be dangerous, actually landing there will be one of the most perilous challenges of the mission. A precise landing at a well-chosen site will not only ensure the safety of the astronauts during this phase of the mission, but it will also make launching back into space easier. Using 3-D data from high resolution scans of the Martian surface, scientists have been analyzing possible sites, evaluating them for both geological potential and touchdown safety. 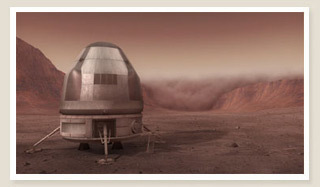 Scientific goals, such as finding evidence of past or present life or liquid water on Mars need to be balanced against possible dangers to the astronauts, lander and equipment. Most scientists agree there is no perfect landing site on Mars —they’re looking for a best case scenario. Since conditions on the surface of Mars are much harsher than that of Earth, everything from extreme temperatures, to high winds, slopes, rockiness, dust devils and the possibility of dust storms and tornadoes needs to be taken into consideration. 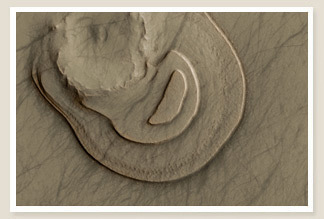 In canyons or craters, rocks can damage landing gear or rover-tires. And on level plains, high winds and thick dust-clouds could cause a difficult landing. Once on the surface, unexpected dust-storm along with whirlwind dust-devils reaching up to 10 km high can cause major problems. Storms and dust-devils can whip up enough dust and violent static-electric discharges to cover solar panels, disrupt laser communications, limit human exploration, and damage delicate equipment. Scientists must also consider possible landing area temperatures years in advance. Although seasonal temperatures near the Martian equator can rise to 22º C during the day, they may drop to as low as -100º C overnight. If low temperatures cannot be avoided, solutions need to be put into practice, such as efficient, non-bulky insulation to keep both astronauts and sensitive equipment warm. Choosing a landing site is a strategic decision, because it will determine what astronauts are able to discover and explore during their time on Mars. Once a landing site has been chosen, its specific characteristics—temperature, terrain and weather—must be factored into mission design. Safe from surface hazards such as rocks and boulders. A good match for the specific scientific goals of the mission. Offers geological and potential exobiological diversity. Easy for the crew to navigate and explore. No steep slopes or inclines. Not overly cold or affected by day-to-night temperature extremes. Protected from high winds, significant dust storms and dust devils. Athabasca Vallles: on the plains of Elysium. Mars History: Why this is a hard thing to do? Copyright © Race to Mars 2018. All rights reserved.